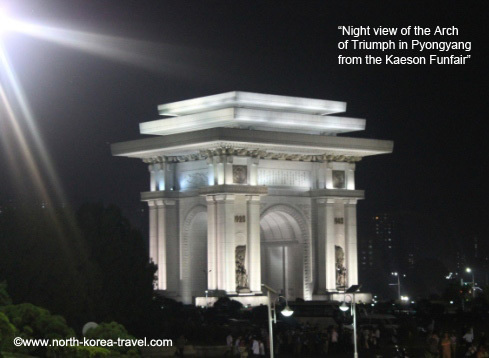 Kaeson Funfair North Korea - Located by the Pyongyang Arch of Triumph this funfair offers you a great a chance to see locals enjoy a free evening. The funfair is an evening one and opens from 7pm to 11pm. 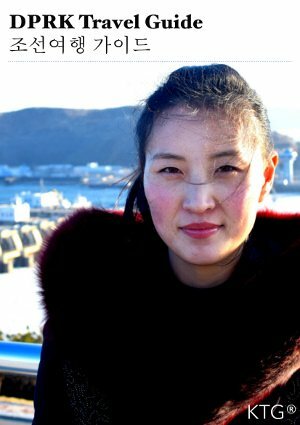 We usually arrange a visit here on national holidays in North Korea as this is when it is busiest but trips can be arranged any day that this North Korean amusement park is open. 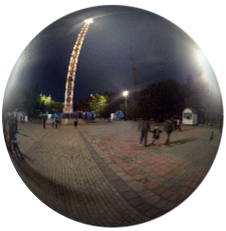 You can see a 360° image below of the funfair with the option of listening to the sound of the time of recording. The rides are modern and… Italian made! The cost of each ride ranges from 1 Euro to up to 5 Euros. 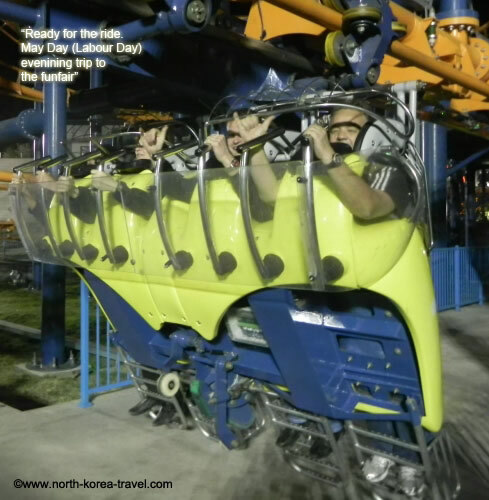 Please note that you do not have to join any ride but going to this North Korean amusement park is a great opportunity to wander amongst locals enjoying an evening of fun. Insider's tip: if you ride the bumper cars you should know that the main aim of the game is to dribble others and avoid hitting other cars which tends to be the opposite in most western countries! We have had more than one traveller ending the game proudly after bumping into any car coming their way… only to be told by our guides that there performance was actually… quite poor. The park also boasts a hamburger joint and a 1990s arcade centre which will bring back some good memories! 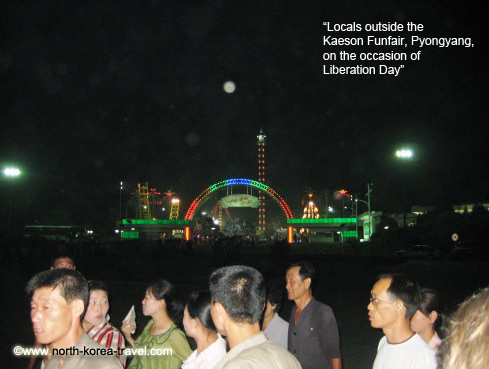 Interesting fact: locals are actually not charged for rides on national holidays at the Kaeson Funfair North Korea. 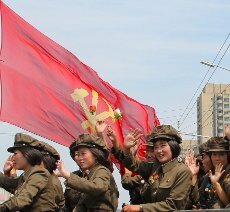 Note: Although the funfair can be packed we can skip the queues given that our time in the DPRK is limited! 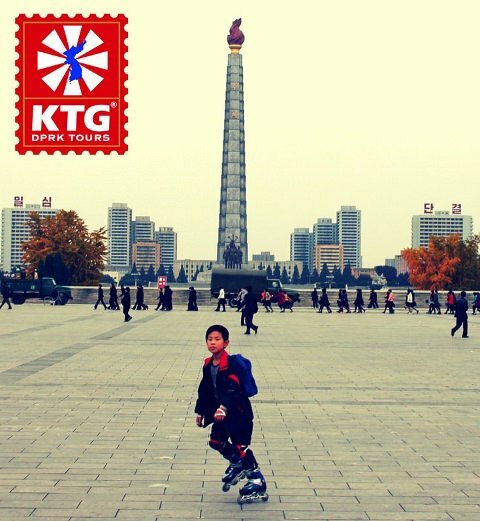 Other optional areas that allow you have fun with North Koreans include the Golden Lane Bowling Alley, the Ice Rink (which is also open when it is not winter), the line skating ground. 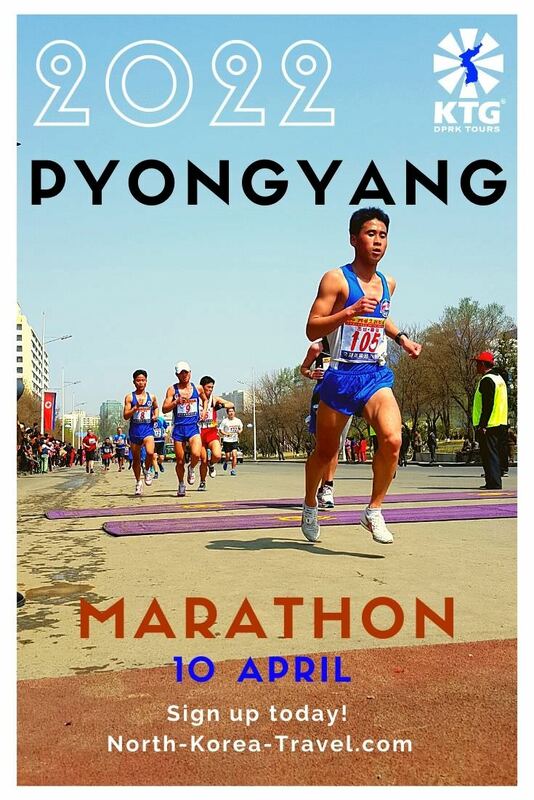 Please check these in our Capital of North Korea page for more details. We cannot help but stress that our group sizes are generally small. Our group departures hardly ever exceed 10 people (excluding independent school departures which we pre-arranged)! 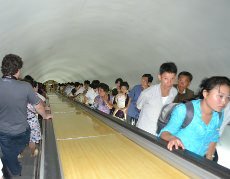 This allows for greater flexibility once in North Korea and for activities which are less feasible with large groups of 30 or 40 people such as for example casual walks around city centres. 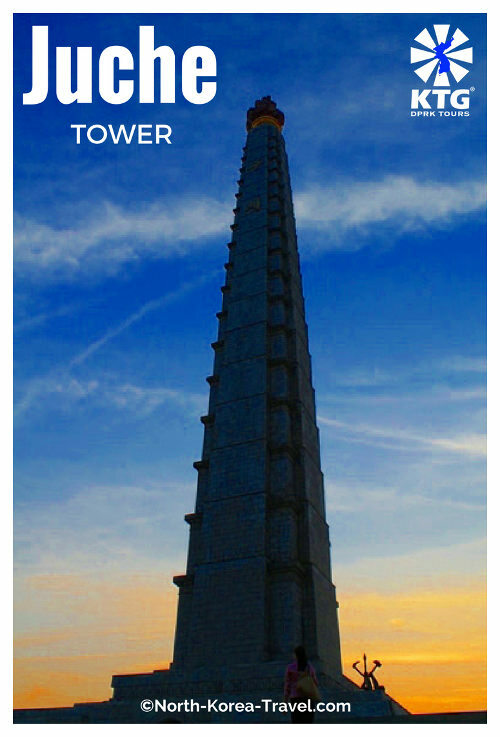 This allows our travellers have a greater level of contact with locals and more insight into what the Korean guides think of their country and the rest of the world and to widen their horizons regarding the DPRK. 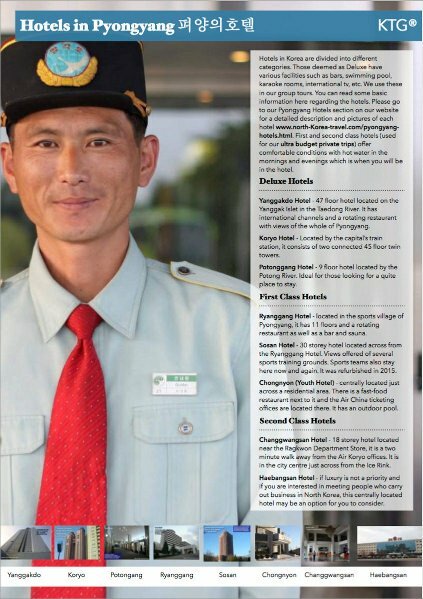 Please click on our North Korea Tourism section to go from our Kaeson Funfair North Korea page to see information regarding trips to North Korea.